[RMVX ACE] CAN SOMEONE DO SOME RE-COLORS OF THIS NINJA CHARACTER SET FOR ME? I need several re-colors which I tried to do myself, but failed hard. If someone can be so kind to help me out, that would be great. 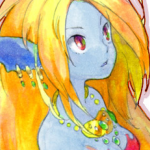 The one I need re-colors of is this. I need two character sets, if you just want to make them single files I can put them together. Set (1) Red, Dark Blue, Aqua, Orange, Yellow, Gold, Dark Green and Lime Green. Set (2) Silver, Hot Pink, Dark Pink, Purple, Maroon, Light Brown, Dark Brown and Olive. Also if possible a rainbow color, thanks in advanced guys and gals! Wow that's quick and amazing! What did you use to do that? You can do this with any graphics program like photoshop, fireworks, GIMP, or others. 2 - Select all skin parts (eyes and bits of face). 3 - Separate the skin from the clothes. 5 - Duplicate clothes layer, fill all clothes with a single color. 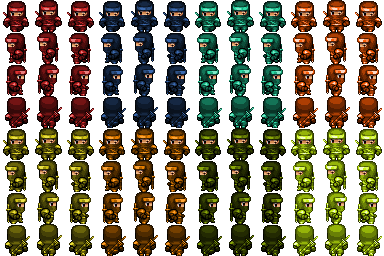 For the rainbow ninja, I filled the color layer with a rainbow gradient before changing the layer's blending mode. Might as well throw this here anyway. This was the actual psp (Paint Shop Pro) file if you wanted to mess around. 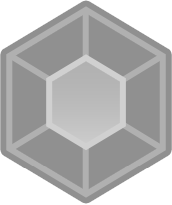 Top two layers are the recolours. The very top changes the actual colour itself, the middle one changes the light/dark of the colours. The bottom is the base. Just paintbucket fill the colours you want on all the parts of the two layers and it'll recolour them easy as pie. 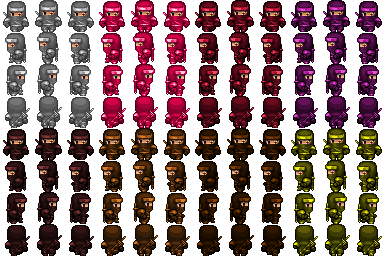 The way I do it is to create a duplicate layer of the sprite (basically an identical copy of the same layer, erase all the parts of the sprite I don't want coloured (the skin, sword and metal parts in this case), then select that sheet and make all the parts one colour. Set that layer to luminance mode (thus making it change lightness of the colour) and set it's transparency down about 25-50 percent, depending on how strong I want the colours to be. I then make a copy of it and set that to colour legacy (or just colour - depends). Then just change colours via paintbucket on the top layer (which is the colour one) and middle layer (which is the lightness one). Someone should mak a gam where Mirak's ninjas and Libby's ninjas fight each other. Bonus points if the rainbow ninja are the leaders and their dispute is over the clashing style of each. Then it's resolved by their god reprimanding them, calling them idiots for getting upset over something so dumb and declaring that from now on they have to all wear black. Liberty, your Ninjas are great to. The response time was amazingly fast. As long as Phil Swift of Flex seal fame is the host.